School of Biological and Chemical Sciences, Faculty of Science, Technology and Environment, The University of the South Pacific, Suva, FIJI. Senior Education Officer Research, Ministry of Education Heritage and Arts, FIJI. The present study aims to evaluate antioxidant properties of decoction and ethanol extracts of Fijian medicinal plants using 2,2-diphenyl-1-picryl-hydrazyl (DPPH) scavenging assay. Thirteen plant species belonging to Melastomataceae, Asteraceae, Apiaceae, Rutaceae, Goodeniaceae, Loganiaceae, Araliaceae, Solanaceae, Polygonaceae, Zingiberaceae and Anacardiaceae families were tested at 0.2 mg/mL, 0.4 mg/mL, 0.6 mg/mL, 0.8 mg/mL, 1.0 mg/mL, 1.5 mg/mL and 2.0 mg/mL concentrations for antioxidant properties. The antioxidant capabilities were compared with ascorbic acid standard. Among the decoction and ethanol extracts tested, all plants showed DPPH scavenging activity. The most potent antioxidant activity was seen in C. hirta with an IC50 value of 0.64 mg/mL. The activity of C. hirta was twofold more potent than the standard ascorbic acid (IC50 = 1.33 mg/mL) indicating that polar extracts of C. hirta contains compounds with relatively better antioxidant properties than ascorbic acid. The plant extracts used in this study were crude extracts, as it is envisaged that if the phytochemicals were isolated and purified from these plants, more prominent results could be expected. These plants could prove leads to safer and better candidates for the future selection of antioxidant. Numerous recent studies have shown that medicinal plants are an important source of antioxidants.15-19 Plants contain a wide variety of free radical scavenging molecules, such as flavonoids, anthocyanins, carotenoids, dietary glutathione, alkaloids, tannins, saponins, steroids, terpenoids and rotenoids.19-21 Therefore, medicinal plants becomes the target to explore cost effective new antioxidants with fewer side effects. In this study, medicinal plants used by traditional healers in Fiji to treat Alzheimer’s disease and related illnesses were screened for their antioxidant potential. Thirteen plant species listed in Table 1 were selected for antioxidant activity based on the traditional knowledge of using polar extracts (aqueous and ethanolic extracts) were used in this study. The fresh plant specimens were collected from their natural habitats from Vanua Levu and Viti Levu in Fiji. The plant samples were thoroughly washed with tap water to remove dust and were dried according to the method described by Mohd et al. 22 in a convection oven at 40 °C for 48 h until there was no change in weight. The dried plant parts were ground separately into powder using an electric blender and stored in an air tight container. The samples were kept in dark until ready for extraction. 12 g of powdered plant sample was extracted with 100 mL of 96% ethanol using soxhlet extraction unit at 60 °C for 18-20 hours. Filtered extract from the soxhlet extractor was concentrated using roto evaporator to yield a dark semi-solid residue. The extract was stored in a refrigerator at 4 °C in air-tight bottles until further use. 10 g of powdered plant material was added to 100 mL of deionised water in a beaker and boiled for 10 minutes. The decoction was cooled and filtered through Whatman No. 1 filter paper. The filtrate was further concentrated by freeze-drying and stored at 4 °C in a sealed bottle prior to analysis. Control absorbance = absorbance of the control reaction containing all reagents except the plant extracts. Sample absorbance = absorbance of the plant extracts. The interpretations of the results were done using the IC50 values (concentration of substrate that causes 50% loss of the DPPH activity) as well as the % radical scavenging activity. A lower IC50 value corresponds to a larger scavenging power and a DPPH radical scavenging activity of the crude extract of less than 20 mg/mL was considered significant. The assays were conducted in triplicates. The data were expressed as means ± standard error (SE). IC50 values were calculated in MS Excel linear regression analysis among the percent inhibition against the extract concentrations. Free radical scavenging activity in medicinal plants has attracted a lot of interest recently. It is assumed that high antioxidant properties of the plants is linked to effective treatment of illnesses. In this study, thirteen medicinal plants were evaluated for antioxidant properties using DPPH assay. The DPPH• is stable organic nitrogen centered free radical with a dark purple color which becomes colorless when it reacts with antioxidants to form non-radicals.25 Thus, in the analysis, lower absorbance of the reaction mixture indicated the higher free radical scavenging activity. The water extracts of all plant species showed free radical scavenging activity, shown in Table 2. Scavenging activity increases with increasing concentration of crude extracts. The most potent activity was shown by C. hirta, which displayed an activity of 94.98% to 98.23% between concentrations of 0.6 to 2.0 mg/mL, followed by B. pilosa and C. asiatica with 22.84% and 20.48% respectively at 2.0 mg/mL. The remaining plants displayed the scavenging activity lower than 20% at 2.0 mg/mL. Ethanolic extracts of all plants demonstrated free radical scavenging activity as shown in Table 3. The scavenging activity increases with the increase in the concentration. Highest scavenging activity was displayed at 2.0 mg/mL for majority of plants. All plant species demonstrated free radical scavenging activity higher than that of the water extract except for C. hirta. The scavenging activity of C. hirta (72.19%) was the highest amongst the plant tested for ethanol extract but lower than that of the water extract (97.93%) at 2 mg/mL. Therefore, C. hirta had the most promising result for antioxidant properties in water and ethanol extracts. Half maximal inhibitory concentration (IC50) refers to the concentration of the plant extract where the response is reduced by half and thus determines the effectiveness of the antioxidant. Those plant extracts with higher free radical scavenging activity had lower IC50 value; in this case it was considered lower than 20 mg/mL to select the effective sample. IC50 values of the thirteen Fijian plants used in this study are given in Tables 2 and 3. For the water extract, the most potent antioxidant exhibiting plants were C. hirta, B. pilosa and C. asiatica with IC50 values of 0.64, 18.24 and 18.24 mg/mL respectively. For the ethanol extracts, five most potent plant species are C. hirta (1.45 mg/mL), A. conyzoides (13.22), B. pilosa (13.79 mg/mL) C. asiatica (15.45 mg/mL) and S. koenigii (17.55). The DPPH radical scavenging abilities of the extracts were significantly comparable to those of ascorbic acid (standard), showing that some extracts have the hydrogen donating ability and could serve as free radical inhibitors or scavengers, acting possibly as primary antioxidants. Percentage free radical scavenging activity of water extracts (decoction) of plants. Percentage free radical scavenging activity of ethanolic extracts of plants. Graph of IC50 values of free radical scavenging activity of decoction and ethanolic extracts. Graph of % free radical scavenging activity of ethanolic extract and decoction of N. Collina. Graph showing plants with reversible free radical scavenging activity. Among different fractions of lyophilized samples of decoction and ethanolic extract, C. hirta belonging to melastomataceae family; showed highest activity which can be attributed to its high antioxidant potential. C. hirta had the IC50 value of 0.64 mg/mL for decoction while 1.45 mg/mL for extraction with ethanol. On the other hand, the IC50 value of ascorbic acid was 1.33 mg/mL. This shows that there were more polar constituents in C. hirta which are responsible for the antioxidant activity. Higher antioxidant activity was noted for ethanolic extract than decoction as illustrated in Figure 1. The DPPH free radical scavenging potential of the tested water extract fractions were in a descending order of C. hirta > B. pilosa >C. asiatica > A. conyzoides > S. koenigii > M. minutum > E. hortensis > P. angulata > N. collina > S. pinnata > P. fruticosa > P.perfoliata > Z. officinalis. C. hirta had similar IC50 to positive control (ascorbic acid) indicating a high concentration of antioxidant components. The antioxidant potential for ethanolic extracts are almost 2 fold higher than that obtained for decoction. 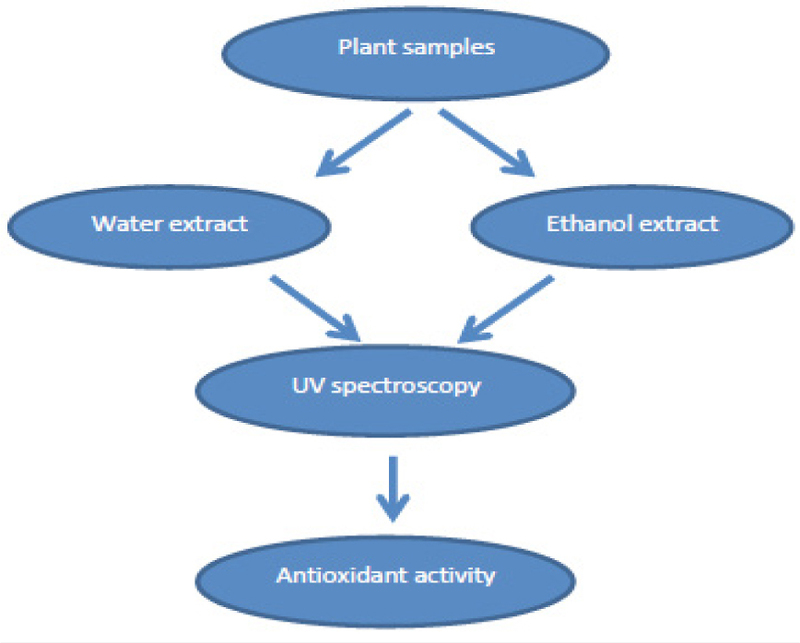 N. collina belonging to Loganiaceae family displayed higher free radical activity with ethanol extract compared to the decoction as shown in Figure 2 in the current study. At lower concentrations, ethanolic extract showed 5-8 fold higher free radical activity, which decreases yet higher activity at higher concentrations. This is consistent with the study carried out by Sudhira et al.26 with Strychnos colubrina also from Loganiaceae family, which showed more potent activity with the methanol extract than the aqueous extract. The study also demonstrated the presence of alkaloids, phenols, glycosides, steroids, and flavonoids in S. colubrine, which is thought to be responsible for antioxidant and antimicrobial properties against Gram-positive and Gram-negative bacteria.26 Similarly, B. pilosa and A. conyzoides both belong to Asteraceae family had shown similar antioxidant activity in this study. According to Shukla et al,27 a group of plants belonging to the family Asteraceae contained phenols, sterols and flavonoids as active constituents. These phytochemicals may also be present in B. pilosa and A. conyzoides that are responsible for anti-oxidative property. Additionally, the methanolic extract of M. edule and M. umbellatum belonging to Melastomataceae family also showed remarkable scavenging capacity on free radicals in a concentration dependent manner.28-29 Rutin, a compound isolated from leaf extract of M. edule had strong reductive capacity on DPPH radicals with an IC50 value of 17.06 μg/mL and ferric ion chelation (IC50 value 17.29 μg/mL) potential. The methanolic extract of M. umbellatum was found with high content of phenol. Rutin and phenol involved in the antioxidant activity might also be present in C. hirta (Melastomataceae) as it exhibits similar antioxidant properties and belongs to the same family. Other studies have shown the presence of glycosides, carbohydrates, tannins and coumarins present in Dissotis longipetala (Melastomataceae) in the bark extract.30 The authors postulated high antioxidant and reducing power to high total phenol and low total flavonoids contents. The results obtained for C. hirta in our study could possibly have high levels of antioxidant compounds, which might be the reason behind its traditional uses in the treatment of a range of illnesses (headache, thrush, haemostasis and skin infections) in Fiji. Most plants showed activity in a concentration dependent inhibition; however, there were a few plant extracts that showed decreased percentage activity with the increase in the concentration. This could be due to (1) the decreased solubility of the plant extract and (2) the turbidity or intense colour of the plant extract with higher concentration that affected absorbance. It was noted that P. perfoliata and Z. officinalis inhibited reversibly upon dilution with water and ethanolic extracts as shown in Figure 3. Water extracts of Z. officinalis showed a 5 fold decrease in free radical scavenging activity at 1.0 mg/mL when compared to the activity at 0.2 mg/mL. Similarly, DPPH free radical scavenging activity for ethanolic extract of P. fruticosa showed a 2 fold decrease in inhibition at 2 mg/mL. P. fruticosa, which belongs to the family of Araliaceae showed an IC50 value of 82.15 mg/mL DPPH free radical activity in the water extract. Similar result was reported for Cussonia arborea, a plant that belongs to the same family as P. fruticosa (with IC50 value 91.93 mg/mL in methanol extract)30 indicating poor antioxidant properties. In decoction extracts, C. hirta showed the maximum free radical scavenging potential (43.11%) at a concentration of 0.2 mg/mL, indicating the potency greater than ascorbic acid (34.33%). Decoction extracts of B. pilosa, P. perfoliata, P. fruticosa, M. minutum, Z. officinalis, A. conyzoides, C. asiatica and N. collina displayed antioxidant properties between 1% to 10% while S. pinnata and S. koenigii showed low potency (activity below 1%) indicating C. hirta may contain compounds with better scavenging ROS species than ascorbic acid. Similarly, ethanolic extracts produced more potent radical scavenging activity at 0.2 mg/mL compared to that of decoction extract with several plant species displaying activity above 10%. The most active plant species at the concentration of 0.2 mg/mL were from C. hirta (46.51%), P. fruticosa (28.53%), N. collina (17.82%), C. asiatica (13.79%), E. hortensis (12.45%), Z. officinalis (11.64%), S. koenigii (11.45%) and B. pilosa (11.38%). All other plant extracts had produced an activity lower than 10% but higher than 1% unlike with decoction where two of the plant extracts displayed activity of less than 1%. This is the first reported study for antioxidant activity of the thirteen plants used except for C. asiatica. The results of the present work showed that both water and ethanolic extracts of all plants demonstrated DPPH activity in concentration dependent manner except for P. perfoliata, Z. officinalis and P. fruticosa. The majority of plants showed higher DPPH radical scavenging activity of their ethanolic extracts compared to their water extracts. The higher antioxidant potential of the ethanol extract may suggest that ethanol is able to extract more active compounds with possible DPPH radical scavenging activity than water. The most potent antioxidant extract was from C. hirta which had 97.93% free radical activity with water extract while 72.19% with ethanol extract at 2.0 mg/mL suggesting that C. hirta contains efficient antioxidant compounds. All the plants tested in this study may offer potential for the treatment of different diseases with their anti-oxidant properties, thus can be promising candidates for more detailed in-vitro and in-vivo studies. 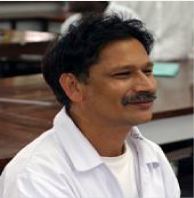 The present study explored the anti-oxidant activity for decoction and ethanol extracts of Fijian medicinal plants. The plants from thirteen species were tested at 0.2 mg/mL, 0.4 mg/mL, 0.6 mg/mL, 0.8 mg/mL, 1.0 mg/mL, 1.5 mg/mL and 2.0 mg/mL concentrations. All plants demonstrated free radical scavenging activity of the water extracts as well as ethanol extracts. The scavenging activity increases with the increase in the concentration from 0.2 to 2.0 mg/mL. The findings encourage studying these plants further in isolating and identifying the active ingredients for their antioxidant properties. 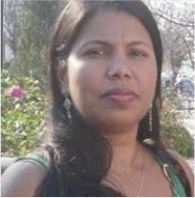 Authors acknowledge the research grant from Faculty of Science, Technology and Environment, The University of the South Pacific. 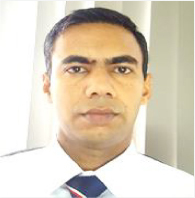 Mr. Ranish N Chand: Senior Education Officer Research, Ministry of Education, Heritage and Arts, Suva, Fiji. Conflicts of interest CONFLICT OF INTEREST Authors hereby confirm no conflict of interest associated with publication of this research work. Keyword: Polar extracts from medicinal plants have antioxidant properties apart from its traditional use. These plants can be investigated to understand the full potential of these plants.